Finally, the weather is drying up, and getting warmer. There is a noticeable buzz in the air, with riders preparing for the up and coming summer season! Toby and I have our first showing show booked for May. It’s a local Riding Club, and they’re allowing me to compete in our Western attire. It’ll be great to see the judge’s reactions! Myself and Toby have been a a bit of a learning curve recently both in and out the saddle. Working on understanding each other a little better out of the saddle to make life easier for both of us. Then still working on our loping but also working on soften and lift exercises for Toby. It’s easy to forget that horses, due to being a herd animal, like to have a hierarchy. It lets them know where their place is within the herd. As an owner I have to make sure Toby knows I’m in charge. This is for my own safety as Toby is quite a bit bigger than me, so I need him to respect me. A horse can be taught this in many different ways, but repetition is a good way to do this. Over the last few months I have noticed Toby becoming grumpy when I put his saddle on. He makes it awkward by backing up and moving around. I had to find a way to overcome this before it got worse. With back problems the first thing that any horse owner may think of is back pain, or the fit of the saddle. With a western saddle I find it difficult to find someone that is qualified in the UK to fit such saddles. However, from his regular back check-up they found nothing to indicate an issue caused by a saddle. He’s fine when being ridden, and I’ve not noticed him favoring a side, and no struggles with lope leads etc. I normally use a step to get the saddle on (if you’ve ever carried or lifted a real American made western saddle, you’ll know why…. They are heavy!) and I also use a mounting block to get on. As soon as the block comes out to put the saddle on, Toby would move over, and the same when getting on. Very frustrating. I contacted my trainer for a lesson, to see if he could help out with the situation. He was sure it was Toby just trying to get the better of me. The day of my lesson arrived. My trainer checked over Toby’s back and watched me tack up. Right on cue, Toby moved over as I got the step out. My trainer took the saddle and put it on Toby. Toby reached round to object. My trainer ignored his objections and didn’t allow Toby to be the ‘alpha’. Toby got the hint and backed off. My trainer repeated the process of putting the saddle on and off whilst moving it about on his back. Toby didn’t move. Next, we walked up to the arena (in hand) and my trainer explained to me that Toby mustn’t over take, or even walk next to me. He must be a foot or so behind me, and not encroach in my personal space. Once in the arena, I walked over to the mounting block. My trainer stopped me and asked why didn’t I get on from the ground? After all, if I am out on a hack and have to get off, there won’t be a block to help me! I checked my cinch was tight (once in the saddle, it’s very difficult, if not impossible to tighten the cinch! ), foot in the stirrup and with a swift jump, hopped on. Would you believe it, Toby didn’t even flick an ear, let alone move a foot! My trainer’s conclusions… I’ve let Toby slowly work his way back up the herd leader ladder, and now he feels brave enough to start making up the rules! I feel we have made good progress over the last few months, and Toby is transitioning well from the upright, collected dressage style to a more long and low frame. We are now building on this. Showing him what different cues (questions) mean, then rewarding him when he gives the right answer. I am now teaching him that when I put my leg on, I’m not asking for more speed. I am actually asking him to soften and lift. What I mean by this I want him to lift with his core, and soften in his neck and jaw. At first when asking him to soften and lift, he got the answer wrong by speeding up, which was to be expected. To correct him I would keep my leg on, asking him to lift and soften. With my reins I asked him to relax his jaw by using an upward bump motion with both hands (unlike in English riding in which each hand creates squeezing a sponge like motion down the rein). When his does soften and lift his core and relaxed his jaw, I’d do the same by relaxing my leg and hands. Eventually, when I put my leg on and ask, he should lift and soften instantly without me even needing any rein contact. Whilst teaching him this new cue, I also need to teach him when I’m asking for him to increase his speed. Voice commands is one way of doing this. Using clicking and the word “trot” when going from walk to jog. When going from jog to lope, I make a kissing noise. When I want him to slow down I use the word “steady”. To stop, I loudly and firmly say the word “whoa”. 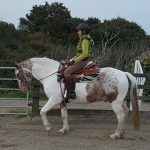 Eventually I don’t want to be using my reins, like we would when riding English style to slow down or stop, it all needs to come from my body and cues. Having done a lot of exercises focusing on making Toby soften and lift I also continue working on his lope work. Toby is now almost established with the walk work (becoming soft and lifting when asked) and he is getting there with the jog work, so we are now beginning to introduce the same work in the lope. As in my previous blog, I described how our lope work was to pick up lope and let him find his balance and rhythm. Not doing anything other than correct him if he fell out of lope. His lope has really improved, and he is much more balanced and forward thinking. I am now using the same cue as I did in the walk and jog. For him to lift and soften; leg on, support him at first with the reins, and then ask for softness. After a few laps of a 20m circle he slowly started to understand the question. On the final one he completely softened and lifted. It felt amazing… I got so excited though I stopped riding, and he fell out of the lope! I tried again, and he answered me correctly, I relaxed, and (this time) remembered to keep riding. After a few strides I asked for a whoa, so he could be rewarded with some chill out time. The headstall doesn’t normally have a nose-band, but you can use nose-bands if needed, especially if you use a bitless headstall. Toby’s headstall has a browband, rather than an ear loop. 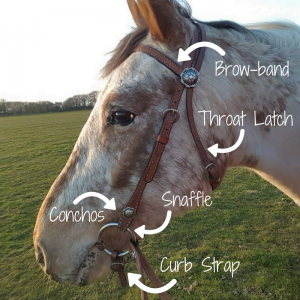 As a rule of thumb, if you ride in a snaffle bit, you have a brow-band headstall with a throat latch (throat lash) this prevents the bridle from slipping over the ears. The reins are longer, and split (not attached by a buckle in the middle). This is so the rider can give the rein and allow the horse to stretch down easily. There aren’t normal billets/buckles to attach the bits and reins to the headstall either. They can be attached via Conchos using screws, or quick tie leather laces. You’ll also notice the headpiece of the headstall doesn’t sit one on top of the other. The throat latch strap lays next to the main head piece and is spaced by a concho loop.